ESO Supernova Exhibition — What is the Universe made of? There is more to the Universe than meets the eye. 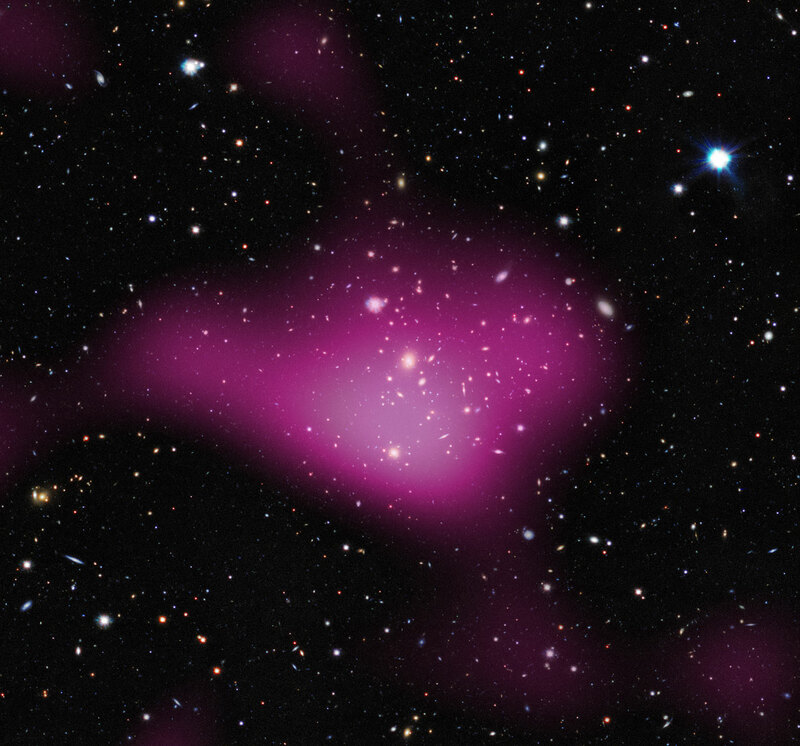 Most of the mass/energy content of the cosmos consists of gravitating dark matter and expansion-accelerating dark energy.The true nature of each component remains a mystery. Dark matter map. 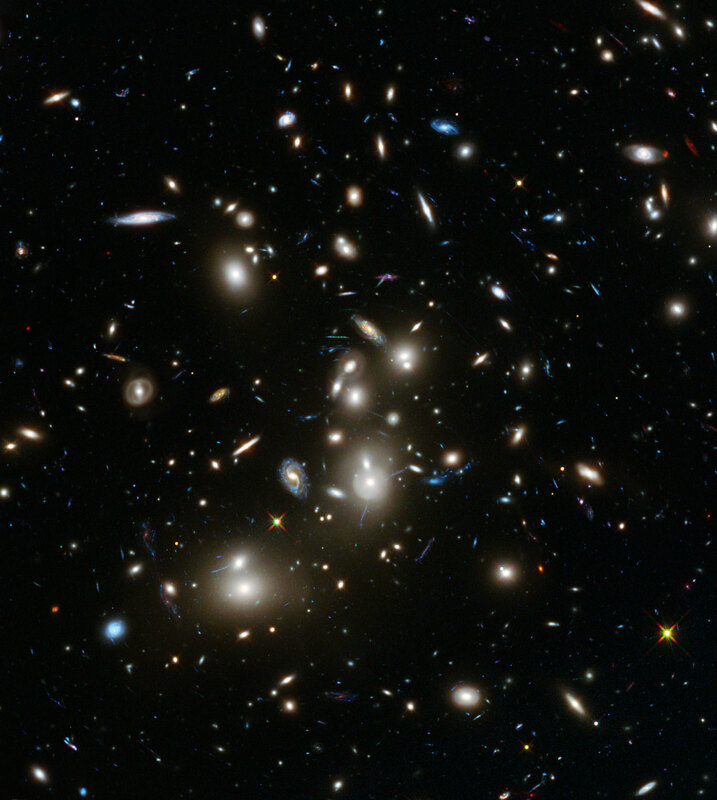 By studying gravitational lensing, astronomers have been able to map the distribution of dark matter in remote clusters of galaxies. The Universe consists of hydrogen (75 %), helium (24 %) and a tiny smattering of heavier elements (1 %). However, the elements that we are familiar with are just part of the story. Both theory and observations indicate that the Universe contains huge amounts of dark matter; no one knows what it’s made of. Moreover, empty space appears to be filled with a dark energy that currently accelerates the expansion of the Universe. In all honesty, cosmologists do not know what most of the Universe is made of. Cosmic composition. All chemical elements other than hydrogen and helium are extremely rare in the Universe at large. Exceptional makeup. The composition of the Earth’s rocky crust is very different from the average composition of the Universe. Cosmic cobweb: Supercomputer simulations beautifully reproduce the filamentary distribution of dark matter in the Universe. Tip of the iceberg: Less than 5% of the total mass/energy content of the Universe is in the form of familiar atoms and molecules. The remaining 95% consists of mysterious dark matter and dark energy. Only 10 % of an iceberg is above sea level. In the Universe, something similar is true: the stars and galaxies that we see make up just a few percent of all there is. No one really understands what the rest is made of.